Fill dutch oven half full of water and bring to a boil over coals at about 300 degree heat. Add macaroni and boil for 10 minutes. Strain macaroni into a bowl and discard the water. Chop onion and measure 3/4 cup. Chop pepper and measure 3/4 cup. Heat dutch oven over coals to about 375 degrees for Frying. Brown and break apart the ground beef for 5 minutes. Cook and mix until ground beef is done, about another 5 minutes. Stir in taco seasoning and water. Cook and mix for another 3 to 5 minutes. Do not drain the beans, corn, and tomatoes. If you do drain them, then add another 1/4 cup of water. 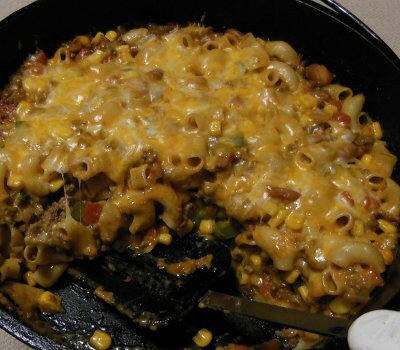 Stir beans, corn, tomatoes, macaroni, 8 ounces of cheese, and salt into meat. Cover with dutch oven lid, move heat to lid, and Bake at about 350 degrees for about 20 minutes. Sprinkle 2 ounces of cheese on the casserole and bake 10 minutes longer. Let me know how you enjoyed your Chili Casserole!